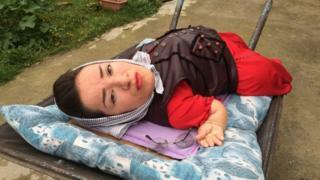 Up to 10 million people in Iran are living with disabilities, campaigners say, but the culture surrounding the issue is largely one of shame, writes BBC Near East Women's Affairs journalist Feranak Amidi. Here, 41-year-old Mitra Farazandeh, who lives with disabilities in a small village in northern Iran, describes her own experience - and frustrations. I am a woman. I am a woman with 75% physical disability. Yes, I have experienced love. I always say that a person who hasn't experienced or felt love is like a scarecrow on a farm - lifeless. I was 11 when I realised I had a special feeling about our neighbour's son. This feeling didn't make sense to me. In those days, I didn't consider myself human. Because of my disability and deformity, I didn't believe I deserved to live. I was waiting for the unwanted moment of death. For 14 years, I buried this love within me. I kept it to myself. After 14 years, I decided to bow down to this love and confess to him and my family. He welcomed my love but my family didn't approve. This made my life hell for a few years. But my love for him taught me how to also love myself - it moved something within me. I want to have my lover hold me in his arms at night and stroke my hair. Unfortunately, many people in our culture believe that women like me don't deserve to love or be loved. This causes me pain. The fact that my father doesn't allow me to be with someone I love pains me. Many other disabled women like me suffer because our sexual and emotional needs are suppressed. I know many disabled women around me whose families are unaware that these women are sexual beings because these women have failed to believe it themselves. If you don't believe you deserve to be loved, how can your family believe it? All people - men and women, able or disabled - have a spectrum of emotional and sexual needs. I personally believe that sometimes the sexual energy of disabled people can be stronger than those who don't have disability, maybe because it is impossible for those of us who have severe physical disability to release our energy the usual way. I think if a disabled woman's sexual needs are not met, it can be very damaging.